The banjo is derived from instruments played in West Africia and travelled to America and Europe with the slave trade. Minstrels and amateur players introduced the instrument to Britain in the 1860’s, and although it was originally regarded with contempt by the upper and middle classes, as Minstrel music caught on the popularity of the banjo grew. It became very fashionable to play the banjo, especially for ladies as the instrument was small and light and made a cheerful sound. 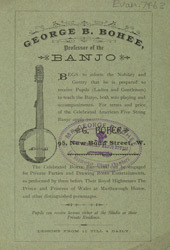 Banjo schools were set up around the country and in cities like London instructors like George B. Bohee would have been highly sought after.